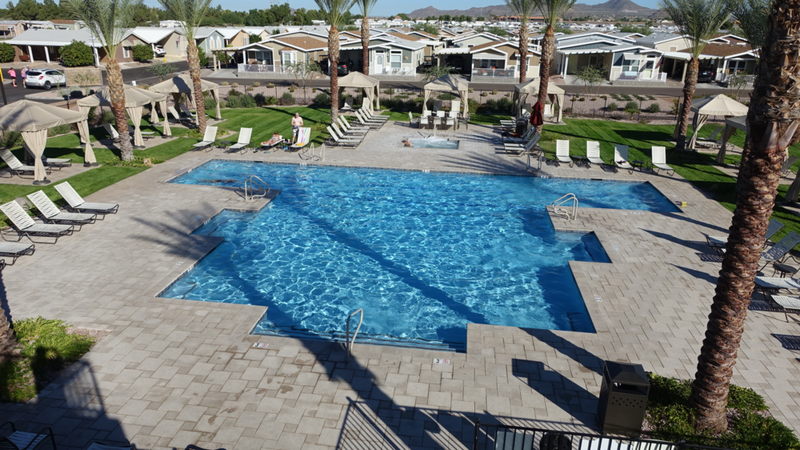 Mesa: Viewpoint RV & Golf Resort Is Heavenly! Recently, I was invited by a golf buddy to drive with him to Mesa, Arizona - to share the driving and get in some rounds of golf. A perfect win-win. While I expected a fun week of golf, I didn’t expect to have my “view” of trailer park living in Mesa radically changed. After a week at Viewpoint RV & Golf Resort, I thought I had died and gone to heaven. Don't Worry Be Happy is everyone's mantra at Viewpoint! No sooner had we parked the car, when the Iowa neighbours (you couldn’t miss their large Iowa University Haweyes’ flag on the front of the trailer) across the street came over and introduced themselves. They immediately invited us to the Happy Hour block party that day – in fact, it happens every Thursday afternoon. Turns out, everyone takes a turn hosting the weekly event. Everyone brings their own beverage and appies to share to this no fuss party. Later, we also discovered every Monday is Burger Night at the on-site golf course restaurant for the 1700 block party people. I love that everyone says “Hi” as they pass by - be it walking, cycling or in a golf cart. I also love the fact almost everyone has a front patio/porch that is well used, with residents and visitors often “spilling out” onto their carport which can easily be transformed into a lovely outdoor living space. No hiding out in the privacy of a backyard here! Yes, I was a little tipsy when I took this pic. No sidewalks, no problem! Everyone shares the road – cars, bikes, pedestrians and golf carts all on the roadways with seemingly equal status. It was interesting to experience a community where the speed limit for cars is 25 km/hr. Not only were the slow moving cars less intimidating, but it was much quieter. As the week unfolded, I became more and more impressed with the amazing array of recreational amenities Viewpoint offers residents. 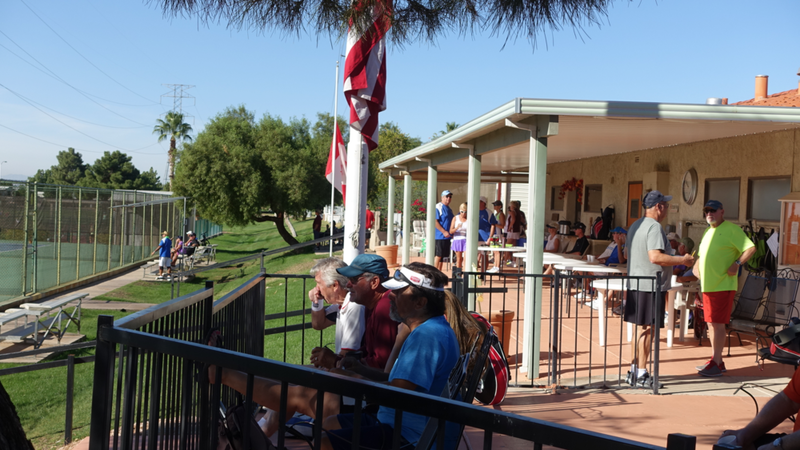 Along with 18 and 9- hole golf courses on site, there are dozens of tennis and pickle ball courts, as well as shuffleboard, several swimming pools and hot tubs, two fitness centers and a very attractive softball diamond. You can’t help but want to be active! If I were to winter here, my active living would definitely increase, maybe adding years to my life. You could of had the pool to yourself this morning! In addition to recreational facilities, there is a large library, a huge mixed-use ballroom/banquet hall (live concerts, church services, dances, show and sales) and dozens of special interest clubs (e.g. aviator, creative writing, computer, Mah Jong, quilting, photography, hiking etc). I understand there is an impressive quilt show in the spring. Pretty much everything you could ask for in the way of everyday needs is just a short distance away – an easy cycle to the grocery store and coffee shop, short drive to major shopping, cinemas and just off the #202 freeway, you have easy access to Mesa and Phoenix airports, other Phoenix area attractions and many hiking trails. Friends who have been going to Mesa for February and March every year tell me the city is definitely under-rated. They love the free weekly outdoor concerts at the Mesa Art Centre, the fun bronze sculpture walk along Mesa’s Main Street, catching an Oakland Athletics and Chicago Clubs spring training ball game, visiting the mega Mesa Market Swap Meet, taking visitors to The Commemorative Air Force Museum at Falcon Field, Barleen’s Arizona Opry (dinner show) and Organ Stop Pizza. Mesa’s great freeways let you get to places like the Boyce Thompson Arboretum, Phoenix Zoo, Phoenix Botanical Gardens and the Musical Instruments Museum - annual “must-see” places for them and visitors. Phoenix's Botanical Gardens is a great walk in a park. LInk: Botanical Garden: Right Place! Right Time! Currently, you can buy an existing trailer home for between $8,000 and $50,000US depending on size, upgrades and location (golf course sites command more money). Or, you can buy a new manufactured home starting at $90,000US. Homeowners lease the site, so there is a monthly fee that includes lease, taxes and free access to all amenities (except golf – but green fees are very reasonable). My friend’s 900 square foot, circa 1980s one-bedroom midpoint-priced home, came completely furnished (including two flat screen TVs), as well as an upscale golf cart, two bikes and a grill. Just bring your clothes, toothbrush, clubs and move in! It quickly became my friend’s home-away-from-home. Viewpoint is huge - over 2,000 sites. The lots are small, each block lined with similar-looking homes with a single car carport. To me, it seemed a bit like camping - all the sites lined up and you can clearly hear your neighbours’ conversations (but nobody seemed to mind). While suburban cookie-cutter homes have a very negative reputation in urban living and planning circles, I began to wonder what is the issue with having homes all lined up and looking alike. Who decides what urban aesthetics are beautiful and what is ugly? Why have trailer parks gotten such a bad rap? The community spirit I experienced at Viewpoint was as good as any place I have ever lived or visited. Perhaps it was because of the homogeneity - everyone being seniors, same socio-economic background and having similar interests. At the same time it was interesting how easily the Americans and Canadians mixed given their different social and political beliefs. Hmmmm…Is the importance of diversity in fostering community vitality over-rated? And, why is the City of Calgary closing trailer parks, when perhaps it should be encouraging them? I am all for integration and diversity, but perhaps we also need to accept and tolerate that humans love to live amongst people with similar life experiences and interests. Isn’t that why most North American cities in the early 20th century had community names like Little Italy, Chinatown, Jewish Quadrant, Germantown? Food for thought! Typical Viewpoint streetscape at mid-day. Yes it looks sterile and deserted pretty much all of the time as everyone is out playing something. Perhaps street vitality is not always a great measure of community vitality. Indeed, it was heavenly to be sitting out on the deck in shorts with a nice cold beer after golf, or having dinner and breakfast al fresco in early November, while knowing Calgarians were experiencing their first taste of winter. It was also heavenly to go for a quick swim and sit in the hot tub before an afternoon siesta or to go to the free library and grab a book to read on the deck. 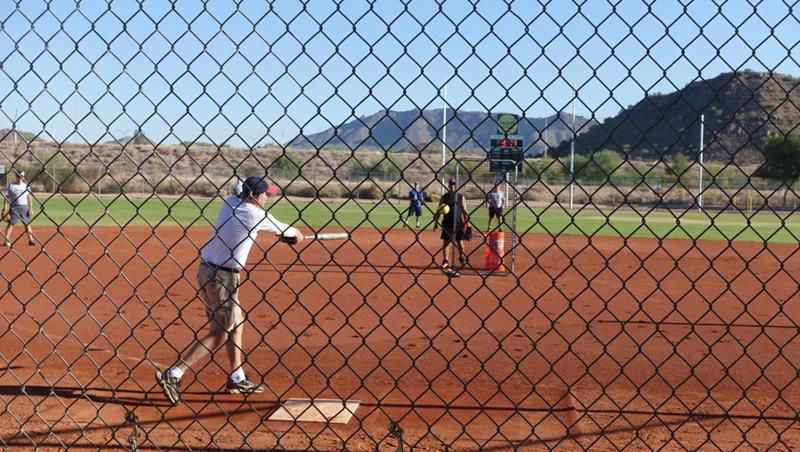 I would have loved to try pickle ball and perhaps take a few swings and shag a few balls on the baseball diamond. In some ways, it took me back to my youth when all I wanted to do was be outside playing sports 24/7. November golf at Raven Golf course was heavenly! On my last day, while enjoying an evening glass of wine on the deck, my friend said to me “I love it here. Everyone is happy!” I agreed! 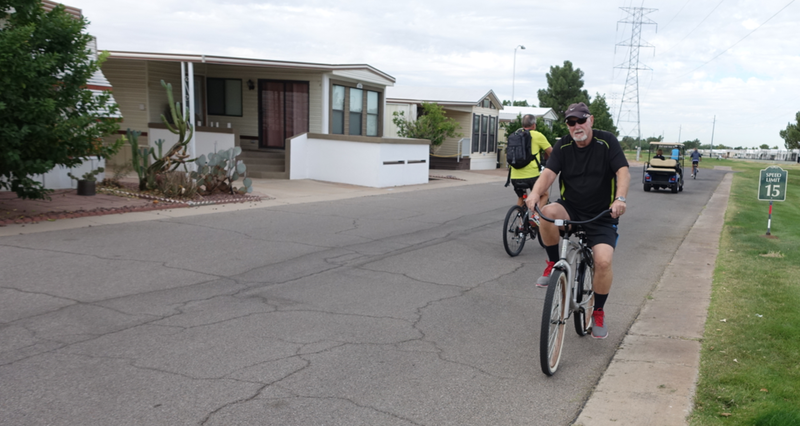 Exploring Phoenix Without A Car? Phoenix "Last Chance" Shopping Frenzy!